Colin Martins current practice explores boundaries between real and virtual world through both film and painting. His current project Empathy Lab is based on a dedicated area in Facebook headquarters were employees can express empathy through technology to various causes. This series of paintings explores a prosthetic relationship with technology. The practice makes reference to science fiction genres and imagined futures that have come to pass such as future orientated culture that has become obsolete or reappraised. The works depict computer museums, analogue recording equipment and modular electronic instruments. Some works depict pre-internet sites of surveillance such as the Berlin Stasi Museum and the geneses of a boundless surveillance culture were the politics of private and public space is fluid. The works explore spaces that blur boundaries between the real and virtual and where technology, culture and politics have become synthesised. Current works depict research and development from technology companies such as Boston Dynamics, Facebook and Tesla. Colin Martin is an artist and lecturer based in Dublin. 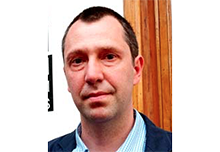 He is currently Head of the RHA School and lectures part time in the NCAD Media Department. He is a graduate of DIT and NCAD and works in the medium of painting and film. Surveille.e.s CCI Paris, curated by Nora Hickey, House Taken Over, Private House, Belfast 2018, This is Not Architecture, Highlanes Gallery, Drogheda 2017, Far From Me, Josef Fillip Gallery, Leipzig, N.O.W.H.E.R.E., Interview Room 11, Edinburgh 2016. He has received the Arts Council Visual Arts Bursary in 2015, 2012 and 2007. Colin Martin has contributed articles and critical responses regularly to VAI Newsletter and has been a panel member recently on Surveillance: A Necessary Evil? at the CCI Paris and The Lives of Artists Winter Seminar RHA 2018. Colin Martin has programmed a number of public talk series in the RHA that run for the academic year inviting leading practioners to reflect on aspects of current visual arts practice. They include On Drawing 2016/2017, Painting As Material 2017/2018 and Lens/Post Lens 2018/2019. He has organised seminars and panel talks such Painters Talking Paint 2018, Split Focus 2019 and Bealtaine 2017/2018. Martin has curated exhibitions What Is And What Might Be, Highlanes Gallery 2016 (with Aoife Ruane and Cliodhna Shaffrey, This Is Not Architecture 2017, Highlanes Gallery (with Aoife Ruane) and Real Real, 2016 Waterford Municipal Gallery. In Partnership with VAI Martin has programmed a series of Critical forums in the RHA led by artists, curators and critical thinkers with contributions from James Merrigan (critic), Seamus McCormick (Bloomberg New Contemporaries) and Jacqui McIntosh (Drawing Room, London). He is the coordinator of the RHA masterclass programme which gives access to the practical skill bases of contemporary artists such as Ellen Altfest, Gareth Phelan, Vera Klute and Marcel Vidal.